Replacing my Side Doho's that have worked great but worn through the left sole, probably from too many left foot down stops. Make me some recommendations. Must be..
Last edited by twowheels; 09-16-2018 at 01:02 AM. Note my main pair of boots is a pair of GoreTex Motorcycle boots I use for more spirited, dedicated or longer rides or riding in cooler or wet weather or with full riding gear. The short boots are to complement these and be used mostly for hot weather riding and commuting in a large city where I need to walk distances off the bike and comfort off the bike is as important as protection. Since wear is spread out I find it does not really cost more to have two pair of boots than a single pair this way. Several companies make "air" boots that have perforated leather panels. I would rather do that than give up protection. I like to "Scream" that I ride a motorcycle. That way I can have meaningful "to me" conversations with strangers. If I am not on a bike I am wearing some type of motorcycle shirt. There is nothing else I am interested in talking about. When I meet locals and they see that I ride they point out interesting and amazing roads for me to ride. It's more out of convenience and cost savings, however. I wear them 12-18 hours a day. Do the laces get stowed somewhere so the loops can't snag on anything? They're pretty short, so I haven't had an issue. Also, the zipper on the side means I never have to tie anything unless I need to adjust the fitment. The sole is a high traction, oil resistant type. I've thoughtlessly done dirty foot stops with absolutely no slipping. And they are wearing much better than my Keens have. A number of manufacturers offer riding shoes or riding sneakers. About five years ago, I wanted something I could ride and commute in, and not have to worry about changing when I got to the office. I found these from BMW on Amazon then. They offered a stiff sole and some ankle protection/padding. I've not seen a riding shoe offer armor -- only padding, and even that was not common when I was shopping five years ago. They also have a velcro strap that covers the laces. That said, I haven't tried these shoes on the Versys yet, because I'm not sure how I feel about "losing" the slight height I get from the heel of my TCX Aura boots, but I did find the shoes really comfortable for all-day wear. I'll bet they have an updated version to replace the discontinued style I currently have. Other riding shoes I like are from TCX. Clearly, I am a fan of Chuck Taylor hi-tops, since that's the style I lean toward. I have the Sketchers Blaine Orson ankle boot, which I bought at Academy but it is usually available on Amazon. Sketchers also has a very similar Dorton Chelsea boot on Amazon (biggest difference I can see is absence of front pull tab, which I never use). These boots have really good grip, which I like since my pea-gravel driveway can be slippery when wet. The boots are also slip-ons with leather on the expanding side gussets just in case you need the protection there (not many boots have this). They are built sturdy, priced nicely, easy to slip on quicly, and look pretty decent with khakis, etc. for corporate casual. Edit: I did add some cheap gel inserts to my boots, and with those these boots are quite comfortable for either lots of standing or walking. Last edited by Rob9876; 09-17-2018 at 03:03 PM. I have 2 pairs of Alpinestars Joey Riding Shoes that I bought back in 2014 that are still serving me well. 1 pair is regular and the other waterproof. I tried on a pair of Revit Taylor shoes at a local store the other day. Right out of the box they were equally/more comfy than my Joey's, with much better protection. I will def be getting a pair when my current summer shoes are finito. 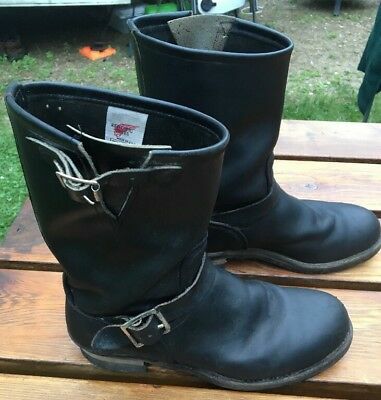 For the past 15 years or so, I’ve been wearing Red Wing Boots during the spring and fall of each riding season. These Red Wing boots have been very good but I now find them a bit heavier than I would like. During the summer season, I wear Magnum Stealth Force 6.0 boots. In the near future, I’m thinking of getting 8-inch tactical sport boots for the spring/fall. I believe that these should be lighter and probably more comfortable than my Red Wing boots. I will certainly know when I try them out at the Pre Fair store. Only specifically designed boots will give the protection you need. I have often ridden in work safety boots, but try standing up in them for any length of time and their lack of instep bracing has them dig into the bottom of your foot. Beware of shorty boots that are cut low at the back above your heel. They are very difficult to get on and off. I have some Alpinestar Ridge 2 Air boots for most riding, including dirt roads, and a pair of Forma low boots for trips.